This paper discusses the problem of rational forming of the financing system for local self-government entities. The concept of fiscal federalism as well as the role and importance of own revenues and revenues from the state budget transfers, which are slightly different from other unitary countries, have been referred to in this context. The aim of this paper is to statistically analyze the selected categories of local self-government revenues in Poland with regard to the local self-government total revenue in 2013 and the total expenditure between 1999 and 2013. The study involved methods for the analysis of dynamics of mass phenomena such as, first of all, fixed base indexes, the average rate of change indicator and the correlation and regression coefficients from time series. The correlation and regression coefficients from time series were calculated with the first difference method. The results of study demonstrate a statistically significant role of transfer revenues in the expenditure (with the exception of voivodeships) and a statistically insignificant effect of sensu stricto own revenues in the case of cities with poviat status, poviats and voivodeships. The results reveal that the spending policy of local self-governments in Poland is highly dependent on a specific category of revenue, which is referred to as “other revenue” in the study, as a result of the inflow of EU funds. In the long term, once this specific, incidental source of revenue has been exhausted, the local self-government finance may face serious disruption. Such conclusions may serve as a practical contribution to the creation of an early warning mechanism in the shaping of present and future fiscal policies. Afonso, A. & Fernandes, S. (2008). Assessing and explaining the relative efficiency of local government. Journal of Socio-Economics, 37(5). http://dx.doi.org/10.1016/j.socec.2007.03.007. Arvate, P. R., Avelino, G. & Tavares J. (2008). Fiscal conservatism in a new democracy: “Sophisticated” versus “naïve” voters. Economics Letters, 102(2). doi:10.1016/j.econlet.2008.11.030. Ashworth, J., Galli, E., & Padovano, F. (2013). Decentralization as a constraint to Leviathan: a panel cointegration analysis. Public Choice, 156(3). http://dx.doi.org/10.1007/s11127-012-9962-8. Bahl, R., & Linn, J. (1998). Fiscal Decentralization and Intergovernmental Transfers in Less Developed Countries, In W. E. Oates (Ed.) The Economics of Fiscal Federalism and Local Finance, Massachusetts: Edward Elgar Publishing Inc.
Blöchliger, H. & Petzold, O. (2009). Taxes and Grants: On the Revenue Mix Of Sub-National Governments, OECD Network on Fiscal Relations Across Levels of Government. Retrieved from http://www.oecd.org/tax/federalism/ 42783028.pdf (01.04.2015). Boyne, G. A. (1990). Central Grants and Local Policy Variation. Public Administration, 68. Breton, A. & Franschini, A. (2004). Intergovernmental equalization grants: some fundamental principles, Department of Public Policy and Public Choice, Working Paper N.42, Retrieved from http://polis.unipmn.it/pubbl/RePEc/uca /ucapdv/fraschini42.pdf (01.04.2015). Ebel, R. D. & Yilmaz, S. (2002). On the Measurement and Impact of Fiscal Decentralization, World Bank Policy Research Working Paper, Retrieved from http://www1.worldbank.org/publicsector/LearningProgram/Decentralization/MeasurementImpact.pdf (01.04.2015). Guziejewska, B. (2014). Dochody transferowe dla samorządu terytorialnego w polityce finansowej państwa. Aspekty teoretyczne a wyzwania bieżące. Finanse Komunalne, 1-2. Grossman, P. J. (1990). The Impact of Federal and State Grants on Local Government Spending: a Test of the Fiscal Illusion Hypothesis, Public Finance Review, 18(3). http://dx.doi.org/10.1177/109114219001800304. Lockwood, L. (2005). Fiscal Decentralization: A Political Economy Perspective, Warwick Economic Research Papers No.721, Retrieved from http://www2.warwick.ac.uk/fac/soc/economics/staff/blockwood/handbook.pdf (01.04.2015). De Mello, L. R. (2000). Fiscal Decentralization and Intergovernmental Fiscal Relations: A Cross-Country Analysis. World Development, 28(2). Musgrave R. A., & Musgrave, P. B. (1973). Public Finance in Theory and Practice, McGraw –Hill Book Company. Johansson, E. (2003). Intergovernmental Grants as a Tactical Instrument: Empirical Evidence from Swedish Municipalities. Journal of Public Economics, 87(5-6). http://dx.doi.org/10.1016/S0047-2727(01)00148-7. Joumard, I. & Kongsrud, P. M. (2003). Fiscal relations across government levels. “OECD Economic Studies” 2003/1, no. 36. Oates, W. E. (1972). Fiscal Federalism, New York: Harcourt Brace Jovanovich. Oates, W. E. (1999). An Essay on Fiscal Federalism. Journal of Economic Literature, 37. Raich, U. (2005). Fiscal Determinants of Empowerment. World Bank Policy Research Working Paper 3705. Shah, A. (2004). Fiscal Decentralization in Developing and Transition Economies, World Bank Policy Research Working Paper 3282, Retrieved from http://siteresources.worldbank.org/PSGLP/Resources/FiscalDecentralizationinDevelopingandTransition.pdf (01.04.2015). Sobczyk, M. (2007). Statystyka, Warszawa: PWN. Smart, M. (1998). Taxation and Deadweight Loss in a System of Intergovernmental Transfers. Canadian Journal of Economics, 31(1). http://dx.doi.org/10.2307/136384. Statistical Yearbooks of the Republic of Poland 2000-2014, Warsaw: Central Statistical Office of Poland. Stiglitz, J. E. (1988). Economics of the public sector. New York, London: W.W. Norton&Company. Surówka, K. (2014). Ograniczenia faktyczne samodzielności finansowej jednostek samorządu terytorialnego – degresja samodzielności finansowej. Finanse Komunalne, 1-2. Tiebout, Ch. (1956). A pure Theory of Local Expenditure, Journal of political economy, 64. Turnbull, G. K. (1998). The Overspending and Flypaper Effects of Fiscal Illusion: Theory and Empirical Evidence. 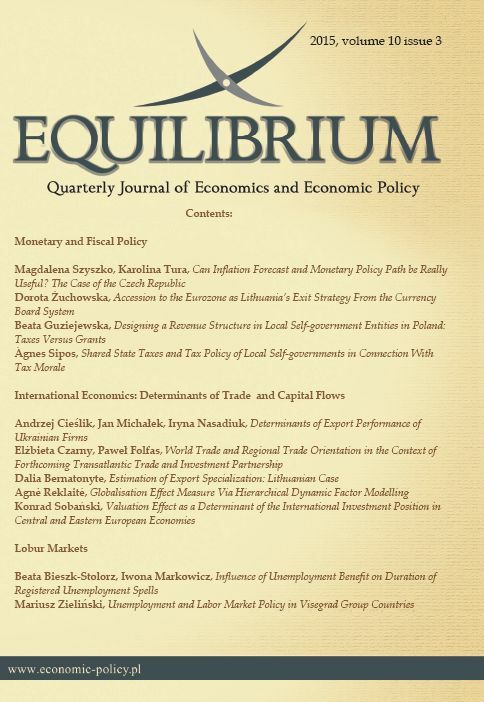 Journal of Urban Economics 44(1). http://dx.doi.org/10.1006/juec.1997.2056. Weingast, B. R. (2009). Second generation fiscal federalism: The implications of fiscal incentives, Journal of Urban Economics, 65(3). http://dx.doi.org/10.10 16/j.jue.2008.12.005. Worthington, A. C. & Dollery, B. E. (1997). Fiscal Illusion and the Australian Local Government Grants Process: How Sticky is the Flypaper Effect? Public Choice, 99(1/2). Zioło, M. (2012). Modelowanie źródeł finansowania inwestycji komunalnych a efektywność wydatków publicznych, Warszawa: CeDeWu.